I first visited the Bendethera Valley in late September and early October 1980 when I was sent there by my work (NSW National Parks and Wildlife Service) to help fight a bushfire. From memory, I spent over five days in the vicinity. I think that I first flew into the area in our helicopter and we flew in and out at least one other day. I certainly remember that I flew back to Sydney from Narooma in it when we left, travelling at under 500 feet along the South Coast was magnificent. I know that I drove in and out a few days as well. We drove in from Narooma where we were staying via Moruya. Since that time I have tried to return to Bendethera a number of times but the weather and other things have caused me to not get there. Kelly and I leave home in Sydney about 7:30 am and arrive at Goulburn just after 9:30 am after a run that started badly with lots of traffic west bound on the M5. Here we meet Ray Wyatt. 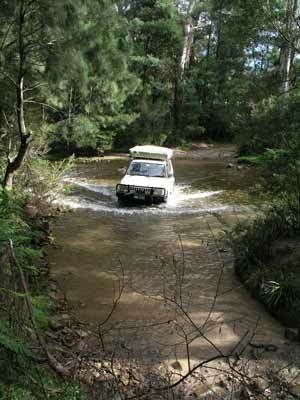 This trip is with our four wheel drive club, the Jeep Club of NSW (don't worry, most members do not own Jeeps). We have some morning tea/breakfast while we wait for Ken Bruderlin and his family to arrive from the Central Coast. Ken has his wife Kareen, sons Kayden and Kelis and daughters Chelsea and Tahlia with him. After we have all refuelled (bodies and cars) and buy some bread, we head south for Braidwood. It is about 45 minutes to Braidwood and as pass through town we see a person selling seafood. Since Kelly loves oysters, I think I had better get her a dozen or else I will be in big trouble as usual. As we head out of town, they miraculously disappear. Our first stop is The Big Hole. This is a collapsed limestone cave that has created a huge hole in the side of a hill. 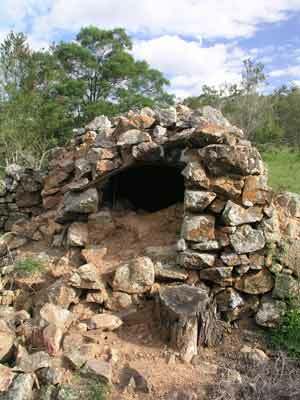 It is located south of Braidwood off the Braidwood to Cooma Road (also called the Krawarree Road). From memory when I was at another fire in this area in 1991, it used to have a sign pointing to its location. However, today it only has a sign that says Berlang Camping Area, Deua National Park (or similar). We arrive at the nice little camping area and decide to have lunch before we do the walk to The Big Hole. As we are eating lunch, Robyn and Chicka Hewitt from our dive club turn up. We have arranged to meet them as they left a few days earlier and have been exploring spots closer to the coast. Ray and Ken decide to head into Bendethera without walking to The Big Hole as it is still quite a way and Ken is towing a camper trailer. Kelly, Robyn, Chicka and I head off on the 3.5 (or 4 if you believe another sign) kilometre return walk. 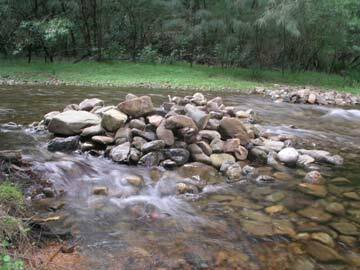 You need to cross the Shoalhaven River which is adjacent to the camping area. Luckily this is not too deep and there are a series of small rocks that form a sort of causeway. This enables you to cross the river without getting (too) wet. It takes us exactly 30 minutes to get to The Big Hole. One thing you can say, it is accurately named! There is a viewing platform that is on the lower edge and it give some good view. However, for decent photographs, you need to walk to one side to get everything in. Kelly has abseiled into the cavern as part of training with the State Emergency Services, better her than me I think. After spending only a few minutes here, we head back to the camping area. It is just before 3 pm when we leave here. We originally planned to visit Wyanbene Caves on the way to Bendethera but somehow we totally miss the turn off (the sign cannot be very prominent). As it turns out this is not a bad thing as you will see. It takes 25 minutes to cover the 27 kilometres to the Snowball intersection. 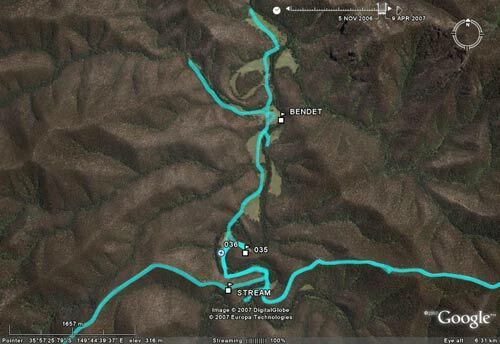 From the turn off at Snowball it is 25 kilometres to the main section of the Bendethera Camping Area. As we enter Deua National Park along Dampier Fire Trail we encounter a bulldozer which is working its way out from some major roadworks. As it goes it is tidying up the track. 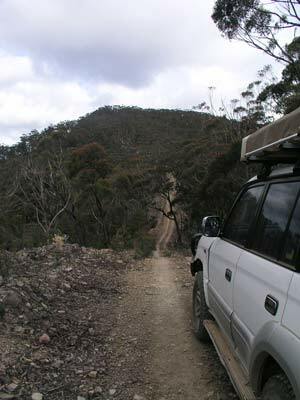 This is a very steep track and it takes us well over an hour and 45 minutes to travel the 25 kilometres. We stop once for about 10 minutes to collect some firewood (not knowing the amount at Bendethera). At one point Minuma Range Fire Trail enters from the right and the track actually changes its name to Minuma Range Fire Trail. The track gets to over 1250 metres at Dampier Trig is probably the highest point and we stop here for four minutes. We pass a track on our left. Minuma Range Fire Trail goes this way and it is the track which we plan to do in two days time from the opposite direction. The track becomes Dampier Mountain Fire Trail and the drop from here to the valley is very steep, requiring low range second gear for large parts. We have averaged about 13 km/h since Snowball. 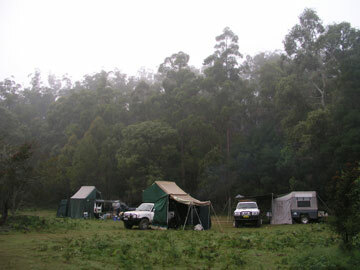 We arrive at Bendethera and cross the Deua River and find quite a few people already camped in this first section. There are literally dozens of camping areas here, nearly all very large (bigger than the MCG say). Ray has already told us where he will try to camp and we had already contacted him on UHF radio as we came down the hill. 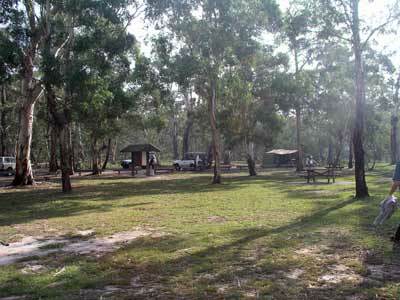 We take a track off to the right and go to a separate camping area that is also as large as the MCG. Ray and Ken are already set up and there is another group at the far end. We quickly set up camp and break open a beer as the fire is stoked. This is a really nice spot. The Deua River is only 40 or 50 metres away and it is really protected from nearly all winds. We have a great barbecue and a few beers and retire for the night relatively early. I awake to find that there is a very fine misty rain. It can hardly be seen or heard but everything is wet and there is a constant "drip drip" as we lay in bed. We get up and have a leisurely breakfast. We are not doing too much today as we are awaiting the last of our group, Brett, to arrive. At 10 am Brett arrives, having left the Central Coast at 4 am. We have late morning tea before we go for a drive up the valley. As you leave the first section of the valley you cross the Deua River again. Ahead is another large paddock, this is called Joeys Flat. There are some nice camping spots on the southern end for larger groups and some small spots for one or two cars along the river on the eastern side. Further along there is another paddock and after crossing a creek, an even larger one than the first few. At the end of this paddock you can cross the Deua River and there is a camping area with space for quite a few medium sized groups. Back across the river and turning right you come to Bendethera Homestead region. This has the remains of the homestead buildings, particularly the bakery, the horse paddocks, some irrigation canals and a grave. There are numerous camping sites here and even now there are a few people set up. Further north the track continues to another paddock which from the air has what appears to be the a dried up old river bed that wends its way around in a loop on the outside edge of the paddock. There is one more paddock to the north of this one. 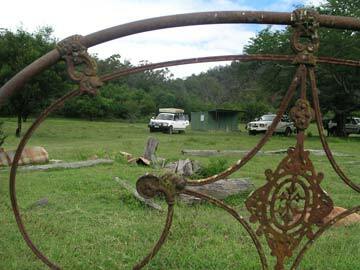 We head back to the homestead paddock and take the track to the west that leads to the Bendethera Cave. We go to the end of the track and park in the car park. 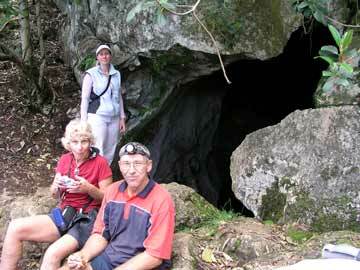 It is four kilometres to the cave, a relatively easy walk for all but the last 350 metres. This last section is quite steep and rough. As this is well described at the car park, only Kelly, Ray, Robyn, Chicka and I do the walk. It takes about an hour to get to the hard section and then about 20 minutes to the cave entrance. We are all quite warm and sweating by the time we reach the cave and need to rest. It is not even a warm day. 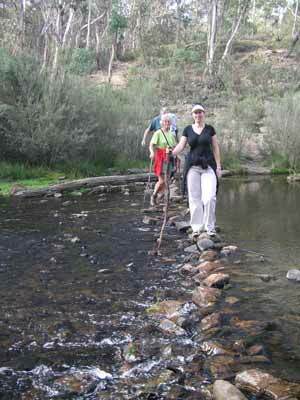 You cross well over 12 creeks to get there, some requiring a bit of balancing to get across the rocks or small trees that form causeways. The cave is quite open at the start and we discover that it is a bit slippery. We go down the first section and then down the ladder into the next cavern. From here it is a climb up using a chain rope and metal spikes in the floor. We get to the next bit but Kelly decides that it is a bit too hard without proper lights and gear (she is right). We head back to the entrance while the others go on. Back at the entrance we see the others' lights now right up high at the back of the cave. Kelly and I decide to head back to the car as we are quite hungry (the others bought their lunch with them and had it at the cave). After a very late lunch (after 3 pm), we head to the homestead precinct and have a look around. There are now lots more people set up camp here and as we walk around, lots more cars arrive. We go back to the camp site and the change to the paddocks on the way is amazing. There are dozens more cars all over the place. We set up our ShippShape again and after a hot shower (using our Twine Hot Shower in the car), we get the fire going as we are having a baked dinner tonight. We have cooked many roast beefs and lambs on other trips but tonight we are cooking a roast chicken. We have a 2 kg chicken and after preheating the oven, we put it on. After about 20 minutes we add the potatoes, carrots and pumpkin. It takes almost 90 minutes to cook, a lot longer than a normal roast. It is delicious, a resounding success. After I take it off the fire, I replace the chicken with a dessert that my mother has made her speciality. It is called Apple Crusty Pudding and is very simple to prepare. I have made it a couple of times when camping and it has come out very good. When it is finished, nearly everyone has some and agrees that it is not too bad. Cut the apples into small pieces and place in a cake tin and sprinkle sultanas over. Put the salt in the flour and rub butter into the mixture. It will be very thick. Break up a little. Add the sugar to the water and stir till dissolved. Pour into the batter mixture and stir. It will look very bad, almost like vomit (charming isn't it?). Pour over the apples. Place in a preheated camp oven. Cook for at least 30 minutes. It may take as long as 60 minutes to cook. To check, take a pointy knife and stick into the apples and make sure that there is no impediment at all. When it is like this, it is cooked. Serve by itself or with cream or custard. After a few more beers (and some wines for Kelly) we head off to bed. This morning was better than yesterday and a little warmer. Temperature is about 10°C. We have to get going early today as we have a big trip ahead of us. We leave just before 9 am and head out of the camping area and crossing the Deua River. We pass the track we came down and head south on the Dampier Mountain Fire Trail (the same one we came in but a continuation). We cross the river again and there is a fairly decent camping area on the left. To the right there is a track that goes about 400 metres to the west along the river. There are one or two camp sites here but they are not much chop. You cross the river once more. We do not explore this track at this time but check it out tomorrow. Past here we start climbing. It is mostly first gear high range but in spots low range is needed. It is 8.2 kilometres to the intersection with Merricumbene Fire Trail. 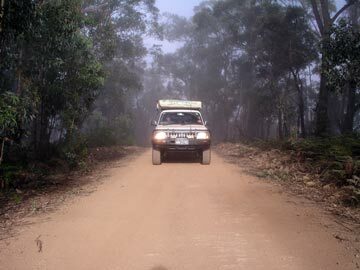 The main track out goes to the right (to Moruya - it is called Bendethera Fire Trail from here) but we turn left. It has taken us 55 minutes to get here at an average speed of just under 8 km/h. The track follows the ridge top and saddles. After about 14.1 kilometres there is a spot that has some decent views into Bendethera Valley. Most of the time along this track the views are not real good as there are too many trees! It has taken 81 minutes to get here. We continue along the track and 5.8 kilometres further along we come to the intersection with Mongamula Fire Trail. We are turning left here. It has taken us a total of 2 hours 23 minutes to travel the 19.9 kilometres at an average of 8.3 km/h. We stop and have morning tea here. After refreshments, we head off down this new track. The track drops fairly steeply down to the Deua River valley again. This end of the national park has some private inholdings so it is difficult in spots to tell what is national park and what is private property. You pass through at least one gate and there are a couple of signs saying "No Camping". It is 10.4 kilometres (50 minutes) to the Deua River and we stop next to the river for a while to stretch our legs. We head off west and cross the river a couple of times. About 2.3 kilometres along there is a track off to the left and to the right and ahead you can see a homestead. You can continue on ahead and go down to the homestead. More about this later as we are turning left here. This track leads to a private property further inside the park. The track is fairly rough and it takes us 16 minutes to cover the 3.4 kilometres. This is a beautiful spot. There is a house here that can apparently be rented and there is a shed that the owner lets people use free (I think that is what the sign inside says). 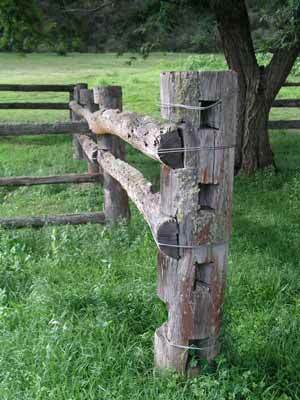 There are cattle roaming the property and a lot of old farm machinery, including horse drawn ploughs as well as a very picturesque iron bed. We stop here and have lunch, spending an hour relaxing. There is another track out that follows the river. I assume that the track that we came in is the all weather track and that the river one can be impassable in really west weather. We cross the Deua River six times and pass a horse camp full of riders and horses. We wonder how they got the horses in here as they appear to be owned by the riders. After 4.9 kilometres we arrive at the old homestead I mentioned before. This is a very old house. There are lots of yards around here and some people in a field searching for something (potatoes or watermelons we think). At this location dozens of cars come in, some from the same direction that we are travelling and a lot more from the opposite direction. These are the only cars we will see in 9 hours on the road, although we hear plenty talking on the radio during the afternoon. The track out of the valley follows a creek for the first section and you cross it about four times. It this starts a steep climb along a ridge. This is low range all the way. It is 7.7 kilometres to an intersection and it takes us 28 minutes to travel this distance. This intersection has a track off to the right (north) that leads to near the Wyanbene Caves. Apparently there are some caves near the end of this track that are marked with numbers but you need keys to access (I think). The track off to the west goes through private property to the Cooma to Braidwood Road. This is not accessible to the public but apparently this is how the people who own the private properties get to and from them. This cuts at least a couple of hours off the alternative routes that we have to use. The track from here heads roughly south along the top of the ridge. To the east is the Bendethera/Deua River Valley and to the right the open farmland is only about two kilometres away. In the valley you can see the paddocks that we had lunch in earlier. The track continues south and 18 kilometres from the homestead you come to a trig and track intersection. This is another track off to the west that leads through private property to the main road but access is not permitted. It has take us 72 minutes to get here. We stop for afternoon tea and some photos as the view to the east is not too bad. After the break we continue on and it gets very steep in parts. For some sections our average speed is only 9 km/h. It is 12.3 kilometres to the Dampier Mountain Fire Trail which is the track we came in on Thursday afternoon. It takes 59 minutes to get here. It is all downhill from here (well, mostly) and the 10 kilometres back to the camp site takes 35 minutes. The total trip was 81.2 kilometres and it took us just over nine hours. The actual driving time was 6 hours and 7 minutes giving an average speed of just over 13.2 km/h. The shorter circuit without going into the northern valley would cut about 8 kilometres and 30 minutes off the journey giving about 73.4 kilometres. Therefore to do this trip safely, making sure you do not rush and that you arrive back in Bendethera Valley well before sunset, you need to leave by at least 9 am in non-summer periods. Back at camp we get the fire going and Kelly and I have hot showers. We even persuade some of the others to use the hot shower. We cook another great barbecue dinner and have a few beers and wines. That night we see some small possums in the tree behind the camp site. These possums have lots of white colour. I have yet to figure out which possum it is. Today is going to be a be of a leisurely day so we are not in any rush to do anything. After breakfast. Kelly and I head off for a walk. We cross the river right next to the camp site and head along an old closed track that follows the river to the north. We see some kangaroos and end up at Joeys Flat. We walk back along the main track to our camp site and also check out a few places along the way. We have morning tea on our return and we decide to go to a fire tower to the east that gives great views to the coast and over a large section of the eastern part of Deua National Park. About this time Ray heads off as he is going to spend the next two nights on his property near Moruya. We head out the same way that we did yesterday and when we get to the intersection with the Merricumbene Fire Trail, we turn right along the main Bendethera Fire Trail (which leads to Moruya). We pass the Deua River Fire Trail, then one signposted Waterpoint Trail which I will mention later and then Messmate Fire Trail. All these run off to the right or south. After 16.1 kilometres (55 minutes) we arrive at the fire tower access track. We park at the bottom as there is a locked gate here. We walk the short distance up to the tower. Yes, some really great views. You can just see Moruya Heads as well as other parts of the coast. It is about 940 metres here and we can see a couple of yachts off the coast. The view to the west and north is also good and we can just see Pigeon House Mountain way off in the distance. After taking in the views for some time, we walk back to the cars and head back down the track. When we get to the Waterpoint Track we decide to explore it. This seems to be a new track as all but the first section is not on Google Earth and is very clean as if only created within the last few months. There is a lot of evidence of a bulldozer at work. We encounter some cars at the Water Point which is in fact a small creek that seems to have a pool of water in it (presumably for firefighting purposes). I am not sure I would want to be trying to get a large tanker out of there once a bit of water had been spilt on the track as it is all clay. We saw the the vehicles that are here yesterday at the northern end of the valley. We continue on and find that it meets up with Messmate Fire Trail. We decide to go down to the end of this and have lunch but it stops after a few hundred metres when both branches are blocked by huge earth mounds. We have lunch here. After lunch, we head back to camp site arriving at 3:25 pm. We set up our ShippShape and arrange everything the way we like it. We have a cup of tea and then Kelly and I take Ken and his children on the same walk we did in the morning. We think that we will see a few kangaroos in Joeys Flat as it is now late afternoon. However, while we see about five small roos on the way, there are none in the paddock. We explore the grassed area and see lots of fresh wombat holes which keep the kids amused. We return back to the camp site and get the fire going again. Tonight Kelly and I are cooking a roast beef dinner so we need some good coals. After a shower and a few beers, I put the dinner on. It only takes about 40 minutes to cook as the beef is smaller than the chicken and seems to cook much quicker anyway. This is a really nice piece of beef, from Woolworths, it is cryo-vacced and the beef is marinated in garlic and red wine. It tastes great! Tonight it is cloudy and a bit warmer than most of the previous nights. We need to get up earlier this morning as we have to be away by about 8 am to get home at a reasonable time. When I awake, I look out the window and see that there is a heavy fog over the hills and it is quite foggy in the valley. We get up and have a quick breakfast before packing the remaining gear away (I have packed up most stuff last night). We leave a few minutes after 8 am. Ken is heading off later in the morning to Ray's place while Brett has already left. 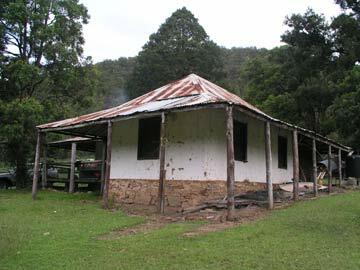 Robyn and Chicka are leaving a little later as they are travelling via a cousin's place to near Captains Flat where they intend to stay the night. We are travelling out via a similar route to that we travelled yesterday. We head along the Dampier Mountain, Bendethera and Little Sugarloaf Fire Trails past the fire tower we visited yesterday. 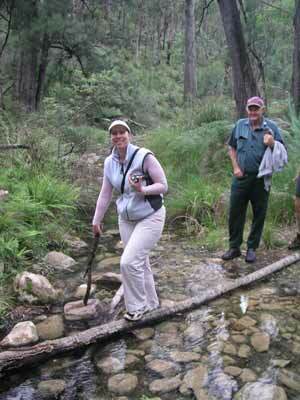 When we are 19.7 kilometres from the camp site, we turn left onto Coondella Fire Trail. This is about one hour after leaving. This track runs roughly north along a ride. About 2.6 kilometres along there is a good spot for viewing the coast and mountains. This is a fairly steep track and the going is slow, we take 27 minutes to travel the 6 kilometres along this track to the next turn. 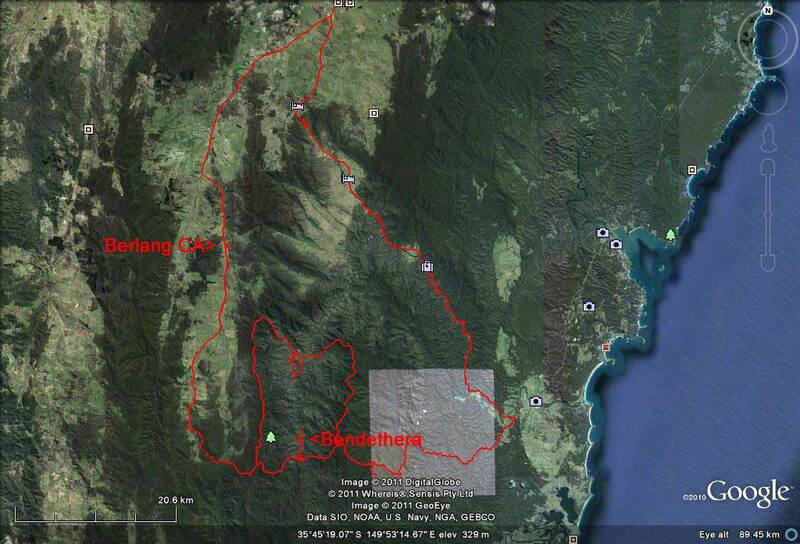 This is Wamban Fire Trail that goes off on the right in a south-easterly direction. We follow this for the next 13.8 kilometres which takes us 75 minutes. We come to the Donalds Creek Fire Trail after 3.9 kilometres and then some other trails at 5.5 and 7.2 kilometres. 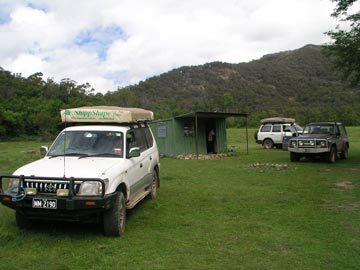 The last track is Mungerarie Fire Trail and we stop for morning tea here. Later we cross a creek a few times and near the end we intersect with another track before we finally come back onto Little Sugarloaf Fire Trail. Here this is a very good road and we sit on close to 60 km./h. From here it is six kilometres to Kiora which is a suburb of Moruya. We turn left here and head up the Moruya River Valley towards Araluen (the signs point towards this town). At first the road is very good but it gradually gets worse till it is not much better than some of the tracks we have been driving on the past few days. For most of this you are passing through private property but in spots there appears to be national park or state forest to the north. 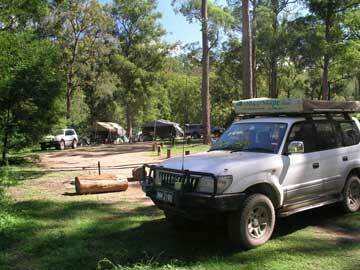 It is 32.9 kilometres to the Deua River Camping Area in Deua National Park. It has taken 45 minutes to get here from Kiora. It is now almost noon so we decide to have an early lunch. This is a nice camping area but too close to the main road for our liking and not all that big (perhaps could hold 6 to 8 tents). The Moruya River here is very nice. It is 21.7 kilometres from here to Araluen and it takes us 45 minutes. This is a nice little town and it has a nice looking hotel. We decide to stop and have a beer. They have a very good lunch menu and it is almost a pity we have already eaten. A few groups of people stop and order lunch. The beer is cold but a bit flat. After the beer we head out of town for Majors Creek. The turn off is not signposted to this town but Captains Flat. We turn left and there is a small picnic area here. There are a few people camped here although I am not sure it is all that legal. This road is a very narrow and windy track. It is 13.6 kilometres to Majors Creek and it takes us 26 minutes. There is a little lookout a few hundred metres before you get to Majors Creek that gives good views back down the valley. From here it is tar road all the way back to Braidwood (17.5 kilometres). There is a bit of traffic coming into town from the coast but we have a good run at 100 km/h back to Goulburn. Once on the Hume Highway, we encounter heavy traffic but apart from it slowing down to about 20 to 30 km/h around Picton and from Campbelltown to Liverpool, it is not too bad a run. We get home about 5:30 pm. All up we have travelled about 800 kilometres and used 120 litres of fuel at a cost of $150. Apart from this, a beer and some breakfast, we have spent no money except for the supplies we took. An excellent weekend at a fantastic location.